"During (2012), our four race tracks held 167 days of live racing and 1,343 days of simulcast racing. Visitors to the tracks wagered $138,181,284." says the Michigan Gaming Control Board. That's down about 5% from the previous year. “It looks like if nothing changes it will force me out of Michigan. And it’s coming soon,” says Shane Spiess. Late last month, several hundred people turned out on a crisp, but sunny afternoon at Mt. Pleasant Meadows. As the announcer called the races from his perch above the grandstand, the crowd below rose to its feet and cheered, or tore up their tickets, as the horses pounded down the home stretch to the finish line. Mt. Pleasant Meadows is no Churchill Downs. The track, a few minutes north of downtown Mt. Pleasant, has few amenities. But it’s the last place to see live thoroughbreds racing in Michigan. Michigan’s three other race tracks (Hazel Park, Sports Creek and Northville Downs) feature standard bred races with horses pulling jockeys riding in sulkies or carts. Shane Spiess is a third generation Michigan horseman. On this day at Mt. Pleasant Meadows, he had four horses running. But most days, Spiess is running his stable of horses on tracks in Indiana, Ohio and Illinois, where the money is much better. But that band aid may not be enough for Spiess much longer. “It looks like if nothing changes it will force me out of Michigan. And it’s coming soon,” says Spiess. Michigan used to have a strong horse racing industry. 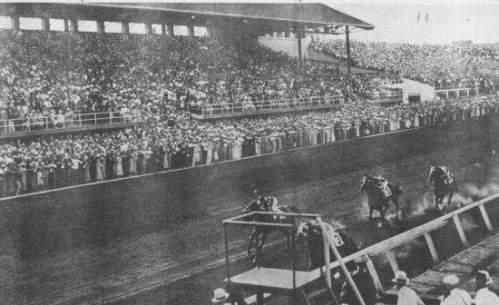 Back in 1933, 20,000 people packed the grandstand at the old Detroit fair grounds to bet on the first legal parimutuel race in Michigan. In the early 1970’s track attendance reached about four million a year at Michigan’s tracks. Today, track attendance is well down, as is the amount of money being wagered. “As much as it pains me to say it, it’s probably the lowest level of racing you can get in the Midwest before you start going to the country fair circuit,” says Joe Nevills, a Michigan native and a staff writer for the Daily Racing Form. Nevills says tracks in other states are tapping into revenue from casino gaming to offer bigger purses and other incentives, something Michigan’s tracks aren’t able to do. He says that means most owners race their best horses out of state. Industry observers agree: Michigan horse racing needs an infusion of cash. But a 2004 state constitutional amendment requires a statewide vote on any new gaming. That’s become a major hurdle to overcome for ideas like combining tracks and casinos. Getting something done may ultimately depend on getting Michigan’s fractious horse racing industry to agree on a solution. Former state horse racing commissioner Bill Ballenger says historically it’s been difficult getting Michigan’s track owners, thoroughbred and standard bred horse associations to agree on anything. “If there’s anything a politician, particularly those in the state Capitol, the Legislature and the governor dislike, it’s wrangling by a special interest that can’t even agree itself on what it really wants,” says Ballenger, who edits the newsletter Inside Michigan Politics. State Rep. Kevin Daley (R-Lapeer) has been working on legislation to help Michigan’s horse racing industry, which seems odd, when you hear him say he doesn’t really like horses or gambling. Daley, who is a farmer, says he’s trying to benefit the state’s wider agricultural industry. A couple ideas that have been discussed include letting people bet using their smart phones and betting on old horse races on video terminals at the tracks. But he says there’s only a short time to reach a deal on a new horse racing bill. While the wrangling goes on, Michigan’s horse racing industry edges closer to oblivion. Horseman Shane Spiess expects he will be the last of his family to race horses in Michigan. But Spiess says he and other old horsemen and women will try to hang on a little longer.